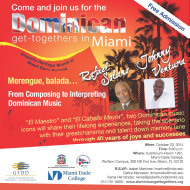 Rafael Solano and Johnny Ventura, distinguished exponents of Dominican music, will be performing in Miami, Florida on Thursday, October 23, 2014 at 6:30 pm at Miami Dade College in the Dominican Get Together event, initiative of Global Foundation for Democracyand Development (GFDD) and its sister organization in the Dominican Republic, Fundación Global Democracia y Desarrollo(FUNGLODE, by its acronym in Spanish), as part of the activities to unite the Dominican diaspora residing in the United States. In the event denominated From composing to interpreting Dominican music “El Maestro” and “El Caballo Mayor” will share their lifelong experiences, taking the scenario with their great charisma and talent. With this event GFDD offers Dominicans living in Miami the opportunity to enjoy more than four decades of Dominican music, joys and successes. This activity has the support of Miami Dade College, recognized educational institution in Florida with whom the Foundationmaintains a close collaborative relationship since its inception. The event will take place at the Auditorium Room 1261 of Miami Dade College, Wolfson Campus, 300 NE 2nd Avenue in Miami,Florida. This is a free event, open to the public and is in Spanish.